The sentence started above the fold. This was the first line. I wondered what person identifying themselves in this way could be writing to me. The letter was from Senator Arthur Sinodinos, State President of the Liberal Party. He is not a member of the legal profession at all! For once, the title to this post has something going for it. On Thursday, Lloyd Rayney was acquitted of the charge of murder of his wife, Corryn. Because it was a trial by judge alone (rather than with a jury), the judge gave reasons for his decision. The case was circumstantial. The main circumstances were the break-down of the Rayneys’ marriage and a place-card in Mr Rayney’s name from a dinner, found not far from where his wife’s body was found buried in a shallow grave in Kings Park. The stuff about the breakdown of the marriage makes dispiriting reading, and the deceased does not emerge prettily from it. (There are also charges, yet to be determined, against Lloyd Rayney in relation to covert recordings he is alleged to have made of his wife’s telephone calls.) The irony is that the more unpleasant the prosecution could show deceased to have been, the more motive Mr Rayney could be said to have murdered her. It’s the reverse of what happens with self-defence or provocation defences where the act of killing is admitted and the defendant is the one who seeks to paint as black a picture of the deceased’s conduct as possible. There was no shortage of evidence, particularly in emails from the deceased and accounts of conversations with friends and relatives. There were statements she was going to take her husband to the cleaners, that she was going to “do him slowly.” There were threats and stated intentions to expose his gambling and his marital infidelity and to embarrass him at court (she was a registrar of the Supreme Court) by such things as getting a court attendant to deny him admission to the court unless he handed over financial information she wanted from him and to cruel his prospects of appointment to silk or any other professional advancement. How bitter or not the marriage breakdown was should probably be put in perspective: at least one of the relevant family law practitioners expressed the view that the level of acrimony was nothing out of the ordinary. One little aspect caught my eye. 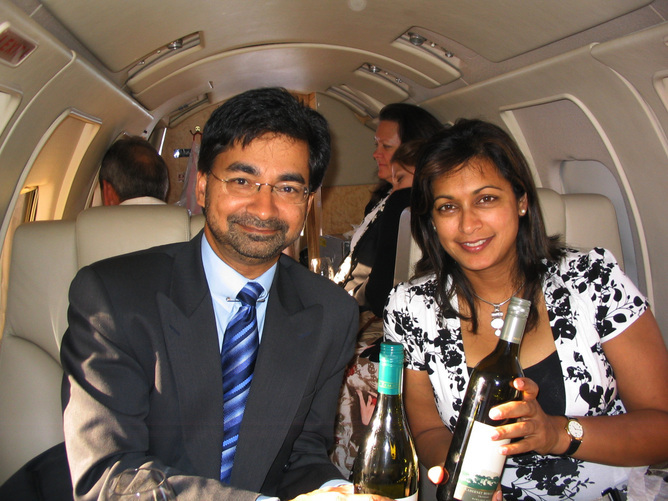 A well-known picture of the couple in possibly happier times, reproduced above, shows them in a plane chartered by Hancock Prospecting Pty Limited, a company controlled by Gina Rinehart, who is recognisable in the background. Apparently HPPL had become a client of Mr Rayney at some stage after he went into private practice. Previously Mr Rayney had been counsel assisting the inquest into the death of Lang Hangcock. Both of these connexions were referred to by Acting Justice Martin in his judgment. In April 2007 the accused and the deceased travelled to Bali in a plane chartered by a client. They shared a villa and appeared to be happy. Ms Black spoke of the accused’s ‘calm and controlled’ demeanour and personality in a particularly stressful matter involving an inquest into the death of a prominent Western Australian person. You are currently browsing the Stumbling on melons blog archives for November, 2012.